Bertha Everard took a leading role in her family as sister to Edith King and as mother of Ruth Everard-Haden and Rosamund Everard-Steenkamp, who together formed the artistic lineage known as the Everard Group. Bertha was born in Durban in 1873, but left for England in 1874 with her mother, Mary Elizabeth King, following her unsuccessful marriage to William King. Bertha and her elder sister were cared for and home schooled in their early years while their mother worked. Between 1891 and 1893 Bertha studied music in Vienna and became an accomplished pianist before turning her attention to art. From 1893 to 1899 she studied at various art schools in England. 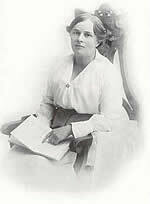 In 1900 she obtained the Ablett Teachers Certificate from the Royal Drawing Society of Great Britain and taught at an English school before securing a teaching post at Pretoria Girls' High in 1902 and 1903. In 1903 she met and married Charles Everard and moved to his farm 'Bonnefoi' overlooking the Komati Valley in Mpumalanga (formerly Eastern Transvaal). Here Bertha took an active role in farm management and, in time, the family acquired an additional three farms. Her daughters Ruth and Rosamund were born in 1904 and 1907 respectively. Bertha accompanied her daughters to Europe in the 1920s when she arranged for them to receive an art and music education abroad. Initially influenced by the trends in English landscape painting, being intimately involved with and economically reliant on the land, Bertha's landscape is imbued with an unusual intensity. Bertha worked in oil paint to depict the vastness of the open grasslands in a stylized manner with a strong use of line and colour. Her early paintings reflect the realistic style of the 19th Century, but she developed a looser style and form of expression having encountered modern European trends in the 1920s. Isolated from the influence of an artistic community, Bertha's landscapes remain untainted by sentimental commercialism that so often characterizes the genre in South Africa and she developed a strong personal vision of the land. In 1910 she was awarded a gold medal at the South African National Union Arts and Crafts exhibition. In 1912 she was awarded the prize for the best landscape painting at an exhibition arranged by Sir Hugh Lane and Lady Philips. She participated in numerous group exhibitions in South Africa and showed her work in London and Paris through the 1910s, 20s and 30s. The first Everard group exhibition was held in Johannesburg in 1931 and the second in 1935. She exhibited her work less frequently towards the end of her life. This, in addition to the fact that she sold few of her paintings has meant that her importance as an artist is often overlooked. This trend was reversed in 1982 when the Tatham Art Gallery held an Everard group retrospective and given considerable momentum with the 2000 'The Everard Phenomenon' exhibition which toured South Africa. Bertha Everard's work can be seen in every major art Gallery in the country and in many corporate collections.